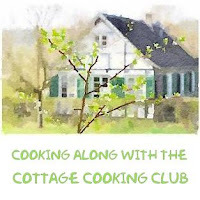 Here we are in the month of October, the Cottage Cooking Club a group of international blogger's cooking together and then posting our experiences along with the Hugh Fearnley-Whittingstall's cookbook, "River Cottage Veg". Our group is meant to be a project aimed at incorporating more vegetable dishes in our everyday cooking, and is and has been inspired by our dedicated leader Andrea of The Kitchen Lioness. Each month Andrea picks one recipe from each of the 10 chapters and then we pick and choose as many as we have time for. Along with this challenge our motto of the month is “Oktoberfest”, which I personally interpreted to mean to use as many autumn like local and seasonal veggies as possible. For the first recipe I prepared the roasted parsnip, green lentil and watercress salad. I prepared the dish exactly as written but substituted spinach for the watercress. We both loved this salad, the textures and flavors were very pleasing. The parsnips were roasted and the lentils were lightly drizzled with a lemon mustardy dressing. For the second recipe I prepared the broiled eggplants with chili and honey. The eggplant was sliced, broiled until golden brown and sprinkled with a drizzle of chili, honey and fresh thyme. Lots of flavor here as the eggplant acts as a sponge and soaks up all the little bits of yummy goodness. Simple but delicious. Now for the last recipe; steamed veg with a hint of garlic. You certainly cannot go wrong with this one and it's a great way to use up extra veggies in the fridge. First the veggies are steamed until tender but still have a little snap to them. This will depend upon the vegetable. In my case I started off with the Brussel sprouts and ended with the peas, basically hardest to softest. When ready to serve butter is melted, minced garlic added and mixture is tossed over the steamed veggies. Another simple but delicious side dish. These recipes have been slightly adapted from the"River Cottage Veg", by Hugh Fearnley-Whittingstall. First recipe; from the chapter "Hearty Salads” (page 90). Second dish from the chapter "Roast, grill and broil" (page 340). Third recipe “Side Dishes” (page 372). To see what recipes the other members chose for this month, head over to the LYL post for October 2015 on the CCC website, by clicking here. That's a nice way to steam veggies -- like the way the garlic is added at the end. And the eggplant looks marvelous! Wonderful trio of dishes -- thanks. Lovesd the three recipe. ..beautifully made using with fresh vegetables. Loving all your Three Recipes series. Everything I see here looks enticing, Cheri! Thanks D it was another great month. My favorite of your recipes is the eggplant. Believe it or not, I have just begun cooking with eggplant in the last year. Not that I didn't like eggplant, I just didn't cook with it myself. Now I think Hugh's Caponata recipe is one of my readers' favorites. My Mother used to cook with parsnips so anytime a good recipe is posted, I will take a second look at it. And, the veggies with garlic, steamed, very nice. Lovely post. Good recipes. Thanks Mary, the salad was my favorite out of all, I usually only use parsnips in stew so having them roasted and in a salad was delicious to me with the earthy lentils. That eggplant looks so intriguing, Cheri. It's like an obvious but I'd never thought of honey and chile. Thank you! Of course, love garlic with anything. And spinach for watercress is a fantabulous switch! Hi Tandy, this month has gone by way to fast. Have a great week-end! Hi Karen, hope they enjoy them! Hi Monica, Yes I know this month has gone by way to fast. Take care! Dear Cheri, great choices of dishes for our "River Cottage Oktoberfest" - you did a marvelous job with all three of them and it is always such a pleasure to visit your blog and marvel at your personal interpretations of Hugh´s wonderful dishes! Thank you for being such a faithful supporter of The Cottage Cooking Club and "see" you very soon"! Thanks Andrea! I am having so much fun with our little group and I love Hugh's cookbook. The parsnip dish sounds so interesting - what a great combination of flavors. I have to try that one! Also a big fan of eggplant even though we don't eat it often enough. Sounds great with the honey and chili. These recipes are all so interesting - great choices! Thanks Tricia, it was another great month, love that the weather is finally starting to change. Three delicious choices Cheri and happy to see your overview. The parsnip lentil seems to be having good reviews so I shall have my eye on that for the future. Hope that you are doing well! See you soon. Hi Peggy, that parsnip lentil salad was really good, the lentils and parsnilps complimented each other perfectly. These all sound great! Parsnips are one of my favorites, both roasted and in soup. I don't use them enough. I must get to work! Hi Abbe, I hardly ever use parsnips either, that is now going to change. All three recipes look and sound delicious. Thanks Pam, I just love this cookbook. You made great choices and they all look beautiful. I especially like the stack of roasted eggplant. I made the parsnip dish, too - so good! Hi Teresa, the parsnip dish was my favorite......Thanks! Thanks Charlie, I wonder why parsnips are so expensive there, very interesting. Hi Sherry, I think we are all a little that way. Take care! These were great choices Cheri. Your parsnip salad looks wonderful with the spinach. I love that Hugh takes less popular vegetables and makes them the star of a dish. And your eggplant stack is very cute. This was such a delicious surprise for me. Have a great November! Hi Zosia, the parsnip salad was my favorite salad of his yet, your right he does make less popular veggies the star, never thought of it like that. Oh how delicious! All these recipes look so yummy, I love eggplant but I think that salad has my name all over it! Hi Julie, the salad was my favorite too! They all sound great. I'm especially eager to try that eggplant. Yum! Hi Beth, the eggplant was delicious, never thought to add chili and honey before. Three excellent dishes for October, Cheri! I have yet to replenish my puy lentils supply, will have a go when I find some! That garlicky green dish is a gem! Hi Emily, another fun month, looks like you prepared quite a few. The green dish was wonderful, great way to clean out the fridge. Thanks Robyn, the salad was my favorite of all, lentils and parsnips were made for each other. Nice choices, Cheri. I didn't try any of these, but you make them tempting, especially the steamed veg. I wonder how the lentil/roasted parsnip salad would be without the greens? I love both flavors together. One thing that I love about this group is getting a preview of the ones I didn't have time to try. Hi Betsy, yes so do I, some of the recipes I would not even try except after seeing what someone else did I can't believe I did not make myself. I love the idea of the roasted parsnips mixed with lentils, and the honey broiled eggplant sounds great, too. Must try both! Fingers are crossed that you get rain. Low 50s here tonight!! Hi David, hopefully we get rain this week, going down to Tucson next week-end. 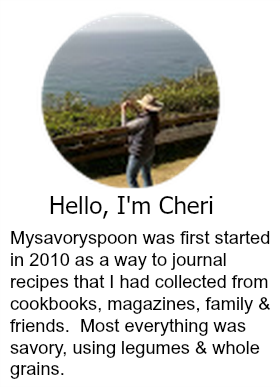 Yummy recipes, Cheri! I especially like the roasted eggplant one. The chili oil on top of it sounds wonderful. Also, the garlic butter over the vegetables in the last recipe would be so delicious. I love anything with garlic! By the way, I just wanted to let you know that sometimes I have a difficult time commenting on your posts. My comments just seem to disappear when I click that I'm not a robot. It's probably my fault, but I'm not sure what I'm doing wrong. Hi Shari, thanks for letting me know, will have to check that out. Cheri, I also made the eggplant and loved its simplicity and the flavors! I was supposed to make the greens and didn't quite get around to them. Good to know that they are worthwhile! Happy November!